State-funded schools in England can receive funding to help them give extra support for all children adopted from care. It has been shown in various studies that children adopted from care do not perform as well as their classmates at school. Early Years Pupil Premium (EYPP) and Pupil Premium provides funding to help education providers give extra support to all children adopted from care to help them reach their potential. 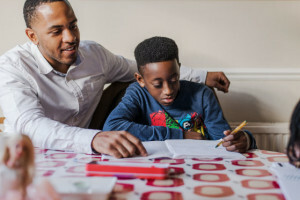 In 2013, less than half of adopted children reached the expected levels of reading, writing and maths at Key Stage 2, compared with 75% of non-adopted children. The Pupil Premium provides extra funding to state-funded schools to help their staff give extra support to disadvantaged pupils including, but not restricted to, those adopted from care. Children in receipt of free school meals or children of forces families are also included. From April 2018, funding was increased to £2300 per pupil and to include all children adopted from care not just those adopted after 30 December 2005 as previously was the case. It is paid to schools so that they can invest in specific support measures to address the issues that may be preventing them from reaching their potential. It applies to all adopted children from Reception class through to Year 11 who are in state-funded education in England and were previously in care in England or Wales. Schools have flexibility over how they use the pupil premium, as they, along with the parents of the adopted children, are best placed to understand their specific needs and to address the barriers that might prevent such children from achieving their full potential. For example, schools could choose to invest in one-to-one tuition or catch-up sessions for particular curriculum subjects, or training for staff on issues relating to attachment. While the money is not ring-fenced to be directly applied to the child, the accountability measures in place around the pupil premium should ensure that schools use the funding specifically to benefit those pupils for whom it has been allocated. So that your child’s school can claim the Pupil Premium, you will need to inform the school that your child is adopted and provide supporting evidence, for example a photocopy of the adoption order. You will need to inform them before the school completes the census. The Spring census deadline is in January each year. This will then trigger the payment of the Pupil Premium to the school for the next financial year starting in April. The Department for Education has more information about Pupil Premium as well as details on accountability reporting. They have also published Pupil Premium FAQS (PDF 82KB).